Learn more about the Lorex Complete 4-Camera HD Home Security System with Led Monitor. Get pricing, and answers to common questions. 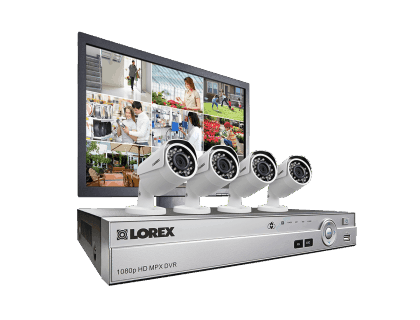 The Lorex Complete 4-Camera HD Home Security System with Led Monitor comes with clear night vision and four 1080p weatherproof security cameras. This Lorex security system's HD quality security monitoring can identify faces and license plate numbers clearly. 1080P DVR can support up to 8 cameras. Pros: Great clarity. Security grade hard drive with 2 TB storage capacity. Cons: Wireless connection may interfere with internet connectivity of your other devices. Bottomline: Complete security system that enables you to spend time away from your business for extended periods if needed. What are some alternatives to the Lorex Complete 4-Camera HD Home Security System with Led Monitor? Where can I buy the Lorex Complete 4-Camera HD Home Security System with Led Monitor? The Lorex Complete 4-Camera HD Home Security System with Led Monitor is available via Amazon and the Lorex website. Does the Lorex Complete 4-Camera HD Home Security System with Led Monitor work at night? Yes. It features LBV2711B cameras with infrared (IR) LEDs that can see up to 150 ft. in ambient lighting, and up to 100 ft. in total darkness. This system also comes with ClearNight imaging, which provides high-quality low-light operation and optimal recording efficiency. Can the Lorex Complete 4-Camera HD Home Security System with Led Monitor be used in any weather? Yes. The Lorex Complete 4-Camera HD Home Security System with Led Monitor comes with four 1080p weatherproof security cameras with polycarbonate housing, and can be used in any weather. These IP66 cameras can operate in extreme temperatures, ranging from -22 °F to 140 °F.